Not too long ago China barred its domestic airlines from complying with the European Union's scheme to impose charges on carbon emissions from flights to and from Europe. Not an AirIndia plane. 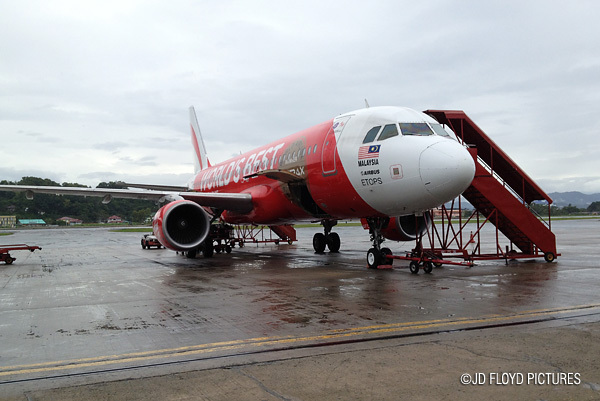 Just one of AirAsia's during my recent trip. Last month (March 2012) India joined China to resist the so-called green-tax scheme. For the record many other countries, including the United States and Russia have opposed to the charges. The purpose of the tax, according to EU is to cut emmission by 20% by 2020. EU has 27 member countries. I think what it will do is it will lift the EU economy by collecting carbon surcharge from whoever make a stop in the European countries and it will at least help some who are in economic crisis. As to how exactly such tax reduce the emissions of carbon, I don't understand. Could it be that the plane would reduce the amount of fuel consumed when the plane get pass EU's airports? Or will the tax monies be put to make the plane to be smarter by burning fuel more efficiently? It's just perplexing! China plus India is quite big but if the US also ban its airlines from paying such taxes, that would be quite substantial! NEW DELHI: India has barred its airlines from complying with the European Union carbon tax scheme, joining China in resistance to plans that have caused a backlash among the EU’s trade partners. The European Union imposed a carbon levy on air travel with effect from January 1, but no airline will face a bill until 2013 after this year’s carbon emissions have been tallied. Civil Aviation Minister Ajit Singh told parliament on Thursday that “the imposition of carbon tax does not arise” because Indian airlines would simply refuse to hand over their emissions data. “Though the European Union has directed Indian carriers to submit emission details of their aircraft by March 31, 2012, no Indian carrier is submitting them in view of the position of the government,” he said. India’s resolution to boycott the scheme follows China’s decision last month to prevent its airlines from complying with the EU directive. The two Asian giants have attacked the EU scheme, calling it a unilateral trade levy disguised as an attempt to fight climate change. According to a so-called Moscow declaration adopted last month by countries opposed to the tax, governments have decided on a list of retaliatory measures to be taken if necessary, including banning their airlines from participating. It also allows governments to take tough retaliatory measures against EU carriers and aviation companies and impose their own taxes on EU airlines. The 27-nation EU has said the carbon tax will help it achieve its goal of cutting emissions by 20 percent by 2020 and that it will not back down on the plan. It claims that the cost for the airlines is manageable, estimating that the scheme could prompt them to add between 4.0 euros ($5.50) and 24 euros to the price of a long-haul round-trip. Industry insiders have expressed concern that the scheme could spark a trade war between the EU and the countries opposed to the tax. The chief executive of European plane manufacturer Airbus, Thomas Enders, called for a “freeze” on the EU plan Thursday, saying that it would otherwise cost the sector thousands of jobs. wow..I have no idea all of this stuff goes on...thanks for the information. The €24 tax for long haul trip won't stop people from travelling, so, I can see them collecting quite a lot of green-tax. Whether or not this money is used to cut down on carbon emmission, we don't know. When economy is not good, the extra fund collected would go to safeguarding a country's financial rather than tackling global warming.